Thank you to the Northboro Southboro Music Association for allowing me to have a book table at their annual Pops Night at the Algonquin Regional High School in Northborough, Mass. The event was attended by over 900 people and featured music from every instrumental and vocal group in the school, many of whose members were featured in Mr. Clark’s Big Band. Former students of Clark’s came up to me throughout the evening and fondly recalled their days in the Trottier Middle School band room in Southborough, noting that they were grateful to have played with him. Upon noticing the rolls of sheet music in the vase on the book table — music related to Eric Green, “Kaleidoscope,” “Swing Shift,” and “A Kind and Gentle Soul” — several teens said they were honored to have been able to perform those pieces. My daughter Abbey (pictured above) helped me throughout the evening. Jamie Clark himself also attended and was on hand when my son Jonah (pictured on the right with Clark), a drummer who was a friend of Eric Green’s and was mentioned many times in Mr. Clark’s Big Band, won a jazz award … that was after Clark was accosted like a rock star by parents, students and grads alike. Since they’d left Trottier Middle School, many confessed, they’d longed for the connection, the camaraderie, the joy of the Big Band. Nothing had been able to fill the space in their hearts that was once occupied by the experience of playing in this space with this man … Mr. Clark and the Big Band are never quite in the past. 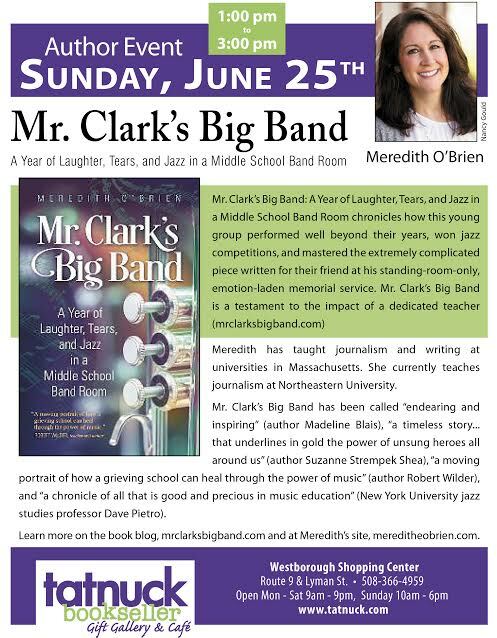 You can listen to the alums of Clark’s Big Band, and their Northborough Melican Middle School jazz alum counterparts, play Van Morrison’s “Moondance” at Pops Night. The alums, who had no rehearsals before the party, used their muscle memory from their middle school years to play what’s now considered a Big Band standard, a piece they hadn’t played in years. Several of them gave up playing musical instruments after leaving Trottier’s Middle School and their beloved music teacher, Mr. Clark. As he thanked those who attended the book launch party, Mr. Clark spoke eloquently about the importance of risk-taking teaching and being able to work in such a supportive environment. SmartMusic honored Southborough’s Trottier Middle School music teacher Jamie Clark–the “Mr. Clark” of Mr. Clark’s Big Band–after one of his former star students won a nationwide jazz competition and named Clark as a chief musical inspiration. Saxophone player Connor Jenks, who just finished his freshman year at the Berklee College of Music in Boston, won the Big Phat Band Jazz Challenge and, when he was invited to Colorado to play with Big Phat Band leader Gordon Goodwin, Jenks chose to bring his middle school music teacher along with him. When I was chosen for the Gordon Goodwin Big Phat Band Challenge I was told I could bring whoever I wanted. I knew immediately it had to be Mr. Clark. He was the person that got me so interested in The Big Phat Band and always told us that in addition to practicing, listening was just as important. I would come home and listen to the Big Phat Band while doing homework and then grab my sax and practice. It is thanks to Mr. Clark – and all of the other wonderful music educators – that I have dedicated my life to music and the saxophone. 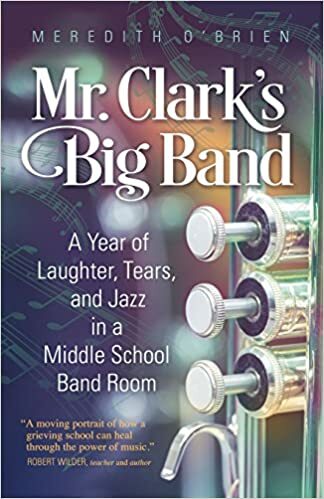 The story of how Jamie taught students music and how to deal with the loss of a classmate is told in Mr. Clark’s Big Band: A Year of Laughter, Tears and Jazz in a Middle School Band Room. 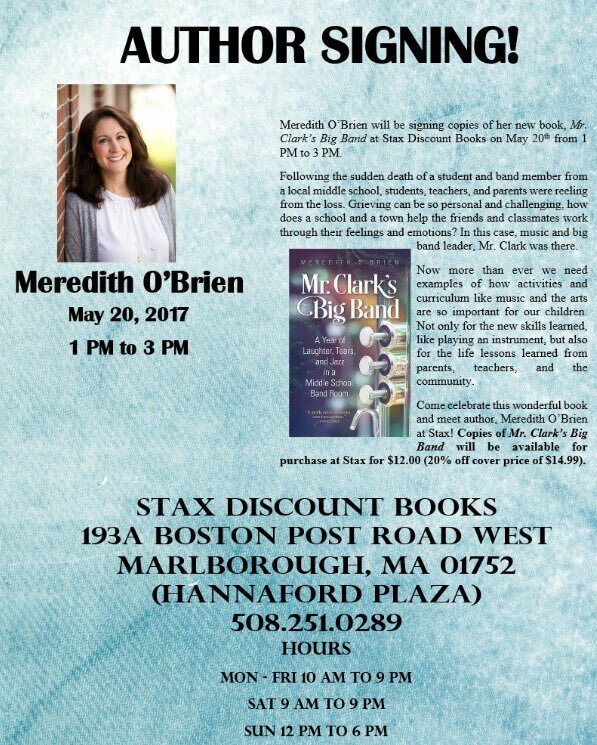 Author Meredith O’Brien followed the Trottier Middle School big band during the 2012-2013 season. Her book gives us insight into the award-winning director’s unorthodox approach. 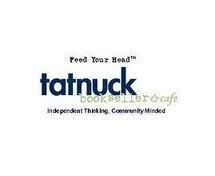 … While not every educator gets a book written about them, they all make a difference in the lives of their students. Jenks (left of photo) and Clark (right) gave professional jazz musician Goodwin (middle), a copy when they met him.